The book centers on the science of pop culture and chaos theory. Connie Willis develops an intriguing tale set in the 90’s of scientists at a large research firm named Hi-Tek. Sabrina Foster studies fad source analysis. Why do we make the decisions we do? What makes us think something is a good idea, that a person is attractive, what we will wear, what we do in our free time, and what we do for a job? Good questions, no? I’d like to know and so would every company in the world. If you know what the next fad is going to be you can make a pretty profit. If you study fads, however, life becomes all about them. Your favorite restaurant has stopped selling iced tea because nobody is drinking tea anymore. Tea is out and coffee is in. If you go to the library what books are on reserve? Sabrina checks out her favorites once a year so the library doesn’t sell them because even Dickens get sold if no one is reading him. The library must cater to its customer wishes and those generally focus on what’s hot right now not 200 years ago. Commitment is in, postmodern pink is in, hairwraps are in, branding is in and so is Barbie. How do you start a trend of positivity, accountability, and a strong work ethic? At Hi-Tek, management is always current on the newest employee engagement trend. They go through 3 to 4 engagement seminars in a season. My favorite had the acronym of GRIM, but another one was SHAM. This made me laugh very hard. 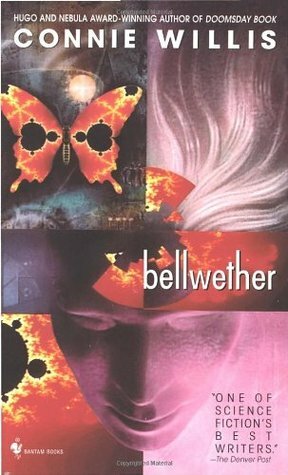 ‘Bellwether’ is a very funny tongue in cheek book. Sabrina studies fads to see how they are started. Her focus is on what caused women to cut their long curls and bob their hair in the twenties. It’s a fad that doesn’t have an obvious source like the Pompadour, named after its trendsetter Madame Pompadour. If she can figure this out she can figure out what truly starts trends. Through her studies she, and every other scientist, is plagued with the interdepartmental communications director named Flip. She is not competent. She, however, is very knowledgeable of what tasks do or do not fall under her job description … mostly the ones that don’t fall under her job description so she can refuse to do them. What Flip is good for is causing chaos and destruction wherever she goes. Flip delivers a perishable package to Sabrina instead of the person it belongs to. Due to Flips incompetence,and Sabrina’s sense of responsibility, Sabrina delivers the package and meets Chaos Theorist, Bennett O’Reilly, who seems to be completely free of fads. He is a perfect study subject. Flip’s errors keep putting Sabrina in Bennett’s crosshairs and they become friends. When Flip loses Bennett’s funding request Sabrina adapts her research project so he can keep his job. Instead of studying Macaque Monkeys for the trigger or iteration in chaotic systems they will use sheep that Sabrina can borrow from a man she’s dating. This interdepartmental study is perfect for studying chaos and what starts trend behavior in higher animals. Management is keen on it and finds all necessary resources to fund it because statistically it has a likelihood to win the elusive and very lucrative Niebnitz Grant. The sheep wreak all kinds of havoc, just like Flip. This is wonderful book. It’s light, it’s humorous, and smart. It’s sprinkled with literary references. There’s even a believable but unobtrusive romance. Connie Willis’s writing and characters are fabulous and worth your time. It’s a short book, and won’t take you much time. By ‘Bellwether’s’ logic it should have been a fad. If you haven’t read it, it’s okay, you can still join the party. Unlike many fads this one is worth your time. Enjoy! 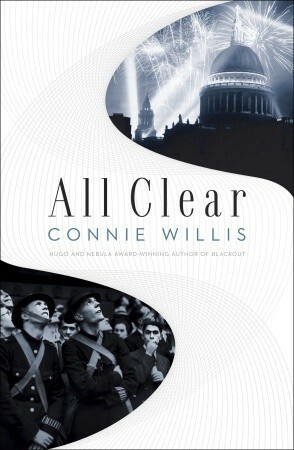 I love historical fiction and science fiction so you could say this series is made for me but I would say Connie Willis did even better on this book than the first. It has more action and ties all the stories together neatly. 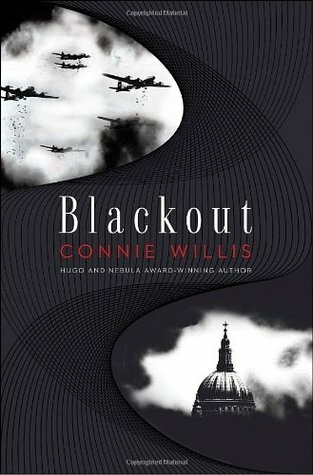 This is the sequel to Black Out which is set in World War II in London. The series follows three time travelers and the entourage they accumulate during the Blitz. It is a unique take on what an everyday Londoner rather than a War Hero or spy experienced. This focused more on the shop girls, elderly men and women, and children experience. All with an enjoyable bit of time travel. I will say I’m disappointed there is not to be a third in this series. I wanted more. I wanted to hear more about Elaine and Polly. I won’t say more about that for fear of spoilers. Katherine Kellgren did a fabulous job narrating this on Audible. After I finished this I got the Doomsday Book (also by Connie Willis) and if you read it, in my opinion, Connie Willis did a much better job on this series but All Clear in particular. Don’t miss out on this. I made my mother, not a huge science fiction fan but a definite fan of historical WWII fiction and non-fiction, download this on her kindle. I don’t do that for anyone because I try not to force anyone to read anything but I made an exception this time. ….oh, and she loved it!